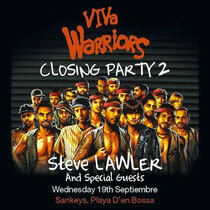 Tonight sees the VIVa Warriors celebrate their last night on Ibiza. After a season of underground parties capturing the real soul of Ibiza’s party scene, Steve Lawler hosts the VIVa Warriors Closing Party Part 2, showcasing Inmotion Music and Bouq. The Brooklyn grown label Inmotion, strives to convey only the most groundbreaking and influential house music from young undiscovered talent to established artists from across the globe. Bouq, founded by production partners Amir and Butch, pushes sounds from groovy deep house to uplifting techno. There’s a banquet of DJ styles and beats on offer, from the deep pulsing house and chuggy minimal of Carlo Lio, to the filthy tech house of Antonio Piacuadio and an injection of Butch’s authentic and unique sound. Leon brings over 10 years of experience from behind the decks, while the dynamic and driven Steve Lawler never fails to deliver. Not to mention, Marco Effe, Sante, Julien Loreto and Amir also taking to the turntables.